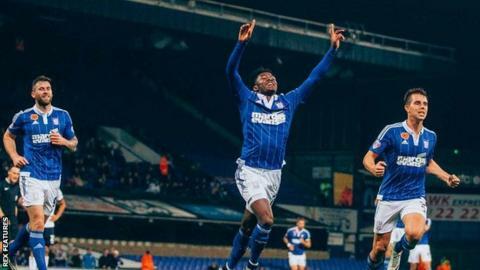 Ainsley Maitland-Niles scored his first senior goal as Ipswich beat Bolton for their first win since 15 September. The 18-year-old, on loan from Arsenal, found the back of the net with a low left-foot finish from 25 yards. Brett Pitman marked his return to Ipswich's starting line-up with his fourth goal of the season as his rasping shot secured all three points. Wanderers failed to really test keeper Dean Gerken as their winless run stretched to nine games. The hosts dominated proceedings and took the lead after just 13 minutes through their young winger. Pitman was unlucky not to score in the first half as his goalbound effort from Daryl Murphy's cross was cleared off the line by Jose Manuel Casado. Substitute Jonathan Douglas continued Ipswich's barrage on Bolton's goal early in the second half, with the midfielder's stinging shot from the edge of the box rattling the bar. With the visitors looking unlikely to score, a brilliant piece of play between Freddie Sears and Pitman split the Bolton defence before the latter netted from a tight angle. Bolton remain in the relegation places having won just one Championship game this season. "We have played well in recent games and not got the result, so to get the win is a relief. "I would have taken a scruffy shinner or an own goal to get back to winning ways but our performance was outstanding. "We had a difficult spell in the first half but we weathered that storm. It was great to get a clean sheet, which was a team effort, and some of the play from the front lads was terrific." "There was a mental fragility but on the basis of previous games, I do think we have the squad. "We need to start showing moral courage to score goals and put our foot in. There is no point being a nice team - we have to start winning games. "I thought we were in the game in the first half, but we never competed in the second half. "If you don't compete in this division, especially against a Mick McCarthy side, you will get beat." Match ends, Ipswich Town 2, Bolton Wanderers 0. Second Half ends, Ipswich Town 2, Bolton Wanderers 0. Attempt saved. Daryl Murphy (Ipswich Town) left footed shot from the right side of the box is saved in the centre of the goal. Assisted by Kevin Bru. Attempt missed. Liam Feeney (Bolton Wanderers) right footed shot from long range on the left is too high. Substitution, Ipswich Town. David McGoldrick replaces Brett Pitman. Attempt saved. Freddie Sears (Ipswich Town) right footed shot from outside the box is saved in the top right corner. Assisted by Jonathan Douglas with a headed pass. Corner, Bolton Wanderers. Conceded by Freddie Sears. Offside, Ipswich Town. Jonas Knudsen tries a through ball, but Daryl Murphy is caught offside. Attempt missed. Freddie Sears (Ipswich Town) left footed shot from the left side of the box misses to the right. Assisted by Brett Pitman. Attempt saved. Daryl Murphy (Ipswich Town) left footed shot from outside the box is saved in the centre of the goal. Assisted by Jonas Knudsen. Offside, Bolton Wanderers. Casado tries a through ball, but Gary Madine is caught offside. Substitution, Bolton Wanderers. Emile Heskey replaces Jay Spearing. Attempt missed. Tommy Smith (Ipswich Town) header from the left side of the box misses to the right. Assisted by Kevin Bru with a cross following a set piece situation. Kevin Bru (Ipswich Town) wins a free kick on the right wing. Darren Pratley (Bolton Wanderers) wins a free kick on the left wing. Attempt missed. Brett Pitman (Ipswich Town) header from the centre of the box misses to the right. Assisted by Jonas Knudsen with a cross. Corner, Ipswich Town. Conceded by Jay Spearing. Attempt blocked. Brett Pitman (Ipswich Town) header from the centre of the box is blocked. Substitution, Bolton Wanderers. Kaiyne Woolery replaces Max Clayton. Attempt missed. Freddie Sears (Ipswich Town) right footed shot from the right side of the box is close, but misses to the right. Assisted by Daryl Murphy with a through ball. Goal! Ipswich Town 2, Bolton Wanderers 0. Brett Pitman (Ipswich Town) right footed shot from the right side of the box to the top right corner. Assisted by Freddie Sears. Attempt saved. David Wheater (Bolton Wanderers) header from the centre of the box is saved in the top centre of the goal. Assisted by Derik with a cross. Attempt blocked. Josh Vela (Bolton Wanderers) right footed shot from outside the box is blocked. Brett Pitman (Ipswich Town) wins a free kick in the defensive half. Corner, Ipswich Town. Conceded by Casado.